Green smoothie obsession has reached an all time high! With the benefits of loading up on veggie-filled goodness, it's really no surprise. We're talking about increased energy, softer, more vibrant skin and of course, better overall health. The only downside is that once we find that perfect, tasty blend, we tend to stick to it. So how about a delicious new recipe to spice things up? Today we're giving you a whole new way to sip yo' greens! 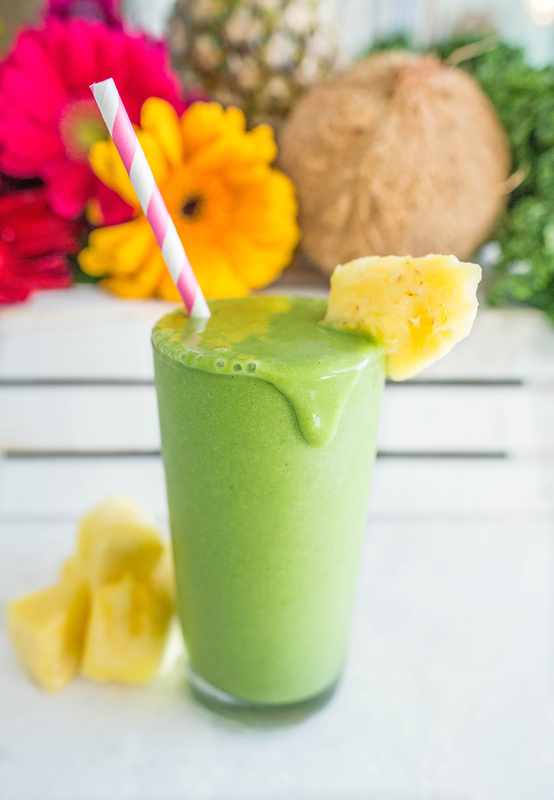 This Coconut Kale smoothie is a beautifying blend with an exotic twist. You're going to LOVE it. It fits perfectly with your Tone It Up Nutrition Plan! STEP 1: Add kale and coconut milk to the blender. If you're not using a high speed blender, de-stem kale first. Blend for a few minutes to ensuring kale is completely broken up and smooth. STEP 2: Add remaining ingredients to the blender and continue to mix until smooth. Serve and enjoy! How amazing is this blend of coconut and kale!? That tiny dash of ginger and cardamon add a nice layer of complexity AND incredible health benefits too. Both of these spices contain anti-inflammatory properties and help promote digestion. Feel free to mix things up by using coconut water instead of milk or baby coconut meat (it's available at health food stores in the freezer section) instead of coconut flakes! Do you have some favorite beautifying ingredients? Let us know in the comments below! This looks great but I can’t have banana (big problem for me with green smoothies!). Does anybody have any suggestions for something I could replace it with? I struggle with this a lot as I love bananas and the taste and texture they give to smoothies but they make me so sick! Haven’t found anything that really replaces them well and have had some major disasters with certain fruits! pumpkin or avocado are great subs for banana! If you’re looking to replace the sweetness banana offers – try dates! a couple of dates and you’re set! Just a hit if avo goes a long way for smoothness and good for skinand hair too!! I couldn’t eat bananas when I was pregnant but I loved to sub with mangos! They give smoothies a creamy texture and add sweetness ? Also mangos and pears. If you want to go with a more sweet creamy texture. try avocado instead of banana! it will still give you that creamy texture. you can peel and freeze that avocado and get a similar consistency! This looks delish! What’s another substitution for Kale? I can’t have it due to thyroid issues. Thanks! Try substituting spinach or romaine lettuce. I agree with avocado for the creamy texture, and to add a slight sweet flavor as well as potassium that you’re missing with the bananas I would add a few dates! Is this smoothie good for m1-m5? Or are there certain meals? Just curious how to fit it into my day! Just made it — FANTASTIC. Really great. Did not have mango, so did not add, and used pineapple that was canned (DOLE), and that was fine. Used kale/spinach mix. Really terrific. Gorgeous bright green color. Now I want it for breakfast every day! I am in :D But where do I find the recipes mentioned in the 7DSD ? in the TIU nutrition plan? Yes, you can find the recipes in the Nutrition Plan Recipe Guide! The Chia Pudding recipe is located on the last page of the 7 Day Slim Down! Found this to be really spicy is that due to the ginger? Didn’t use perfect fit powder didn’t have any. Also the kale didn’t blend to smooth or the coconut flakes I kept chewing on them while I drank my smoothies any suggestions? This sounds yummy and tropical! Is the coconut milk meant to be the coconut milk used for cooking or coconut milk beverage? This looks like it can be M1-3. Love the pineapple! hi to all my fellow members: could we do this for the 7dsd? Try blending your kale and liquid alone first, until you just have green liquid, no bits. Then add your other ingredients and blend. This is my all time favorite smoothie secret. Works for any leafy greens! Just noticed that this tip is actually step one in the recipe. ? If that isn’t working for you, I’m not sure what to suggest. I pulverize my kale with a food processor and then store it in ice cubes with a little water. When I make the smoothies, I just toss in a few cubes. Helped me get a better consistency, and I always have fresh kale ready to go. This is a great tip! Thank u! I’m going to try this because I usually end up wasting kale sometimes because you get so much? I am making this for #M1! Looks amazing! I’m allergic to mango, banana AND pineapple (and most everything else associated with a latex allergy) so I’m just skipping all 3. I think it will still taste delish & be nourishing! What did you wind up doing? Just made this for the whole family, minus the Perfect Fit. The kids loved it! I love the zip that the ginger brings. Another ?!!! I just made this & it’s so yummy!! Great addition to my list of favorite smoothies. This was so good! I loved the ginger in it!!! Can you have this on the 7 day slim down? What meals/time of day can this be for? What did you wind up doing? I’m allergic to pineapple, banana AND mango (and most everything else associated with a latex allergy) so I usually just skip what I’m allergic to. I think it will still be tasty! Very spicy was it the ginger?! Also the kale was very chewy and I followed the steps verbatim. Any suggestions?!! Also are you using for meal replacement or snack? Is this acceptable for a M4?? Or because of all the fruit should it stay in the morning for a M1 or M2?? So delicious looking!! I don’t have any cardamom, but I’m making this with everything else tomorrow. Will it be as good with coconut protein? I’m looking forward to using my kale in the am & having the chickpea salad sandwich for my M3.